If you’re a parent, you know how much your choice of restaurant is motivated by your offspring. Unless it’s dinner, because then you know they’ll fall asleep at some point (evoked memories of many a nap at Chopsticks, Sirifort, when we were younger). So, it’s always super if the restaurant is helpful, supportive of your litter, and thus, conducive to a peaceful family meal. Here are some restaurants in Delhi NCR that should be on your list when it comes to family dinners. Someone may advise you to head here if you’re the parent of a boy, but why leave gamer girls behind? A virtual paradise for gamers and sports fanatics, spread across 47,000 sq ft; we’re talking cricket simulators, goal-keeping and racing. No, they didn’t forget snooker and bowling. They also feature virtual reality experiences, essentially, a mix of motion and positional tracking, in addition to head-mounted displays and superior quality graphics. Take your inner child (and your real child) and ball out. All we’re saying. This on-point Indian restaurant also does another great service – their kitsch interiors. In terms of space, it isn’t very open, so children cannot run around, but they can entertain themselves with the truck facade and knock back their range of colourful mocktails. And parents, cocktails for you! Staying true to that Indian hospitality, the staff and management welcome children, are super-friendly, and will go out of their way to accommodate food allergies and preferences. Children and chocolate. No prizes for guessing why your child will be nothing short of happy here; all kinds of dessert, fondue, chocolate shakes, hot chocolate, and even chocolate pizza. Make sure you’re in big, open spaces after this meal – we don’t need to tell you what sugar does to a child. Where: Find out the one nearest you here. Maybe the words ‘dedicated Kids Zone’ should tell you all you need to know about how child-friendly this spot is. Although it doesn’t really matter. Given the tropical rainforest theme the entire restaurant follows, the whole space is super for children. Special mention to the underwater themed section, in case the forest gets to be too much. Also, parents, they have a 7-course buffet meal available, so you have much to keep you occupied as well. A solar-operated little toy car greets you at the entrance, and we can guarantee your kids will greet it with much fervour. Since much of it is outdoors, junior will love the open space and the chance to run around in between bites of the beautiful food. The ground is pebbled, so we’d recommend asking the little one to be careful. Not that you don’t constantly already. Hey, who doesn’t like an unlimited and expansive buffet? With live grilled meats and veggies, main course options in both veg and non-veg, dessert and more, Barbecue nation makes for the perfect restaurant for fam dinner plans. They’ve even got a special buffet option for kids! Pandara legend, Gulati’s, should definitely be on your list (as it is on ours) if a family dinner is on the cards. Famous for their delicious Mughlai cuisine, Gulati’s knows how to deliver an all-round experience when comes to the food. We find ourselves enjoying the kebabs and the kadhai chicken the most. If ever there was a place to treat the kids to North Indian cuisine that’s true to the heart, this is it. 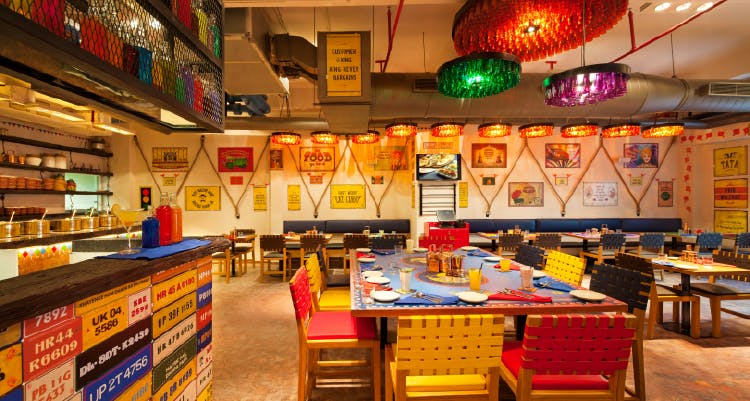 This might be the ultimate dine-in for adults and kids alike in West Delhi. They’ve got a garden theme and a buffet-style menu. The best part? They’ve got a dedicated play area for the little ones with toys and games! So, if you want to have a good meal and the kids want to play, head to The Mellow Garden to check both off the list. The whole place is one giant train on the outside, so you can expect the kids to start jumping the moment they spot it. Their USP? The menu is a mix of vegetarian street food from various places across the country. You’ll find everything from bhelpuri, pav bhaji, and samosas to pizza dosa, momos, and nacho corn chaat. Shibuya’s oriental cuisine has been on our list for quite a while. The cherry blossoms on the wall, the delicious cocktails, and the mushroom and bacon fried rice are what dreamy dinner plans are made of. Why should the adults do all the feasting here, though? They’ve got a special kids menu that has soup, skewers, butter jasmine rice, hakka noodles and drinks like Oreo, Nutella, strawberry and cream shakes and more that the little ones can enjoy.